MSU beat reporter Will Sammon and sports reporter Brody Miller talk MSU and what it means against LSU. RUSTON, La. — In lieu of the traditional college football Sunday day-after story, The Clarion-Ledger will instead this season offer an “exit survey” following each Mississippi State game. Below, beat writer Will Sammon and sports features writer Brody Miller relive the Bulldogs’ 57-21 win against Louisiana Tech. Will Sammon: Dominance can sometimes look pretty weird, it turns out. Brody Miller: Louisiana Tech was most at risk whenever it had the ball. WS: The only way this game was going to receive national attention was if Mississippi State lost or something wild happened. Well, something wild happened. And it was glorious. A bad snap and a couple of good kicks resulted in an 87-yard loss for Louisiana Tech. Let’s explain. On second and goal during the fourth quarter, the ball sailed over Louisiana Tech quarterback J’Mar Smith’s right shoulder. Smith tried to recover the ball 25 yards down the field, but failed. One Mississippi State player then kicked the ball as he tried to pick it up. Then another did the same. Then yet another one did the same. Finally, Louisiana Tech’s Cee Jay Powell, who beat Willie Gay Jr. in a foot race for the ball, recovered on the Louisiana Tech 7. It was third and goal from its own 7 for Louisiana Tech. Yes, they were forced to punt on fourth and goal after not being able to convert from 93 yards. Dan Mullen’s response was highly entertaining, by the way. BM: That is obviously the most memorable sequence, but for variety’s sake I’ll go with Jeffery Simmons’ blocked punt and touchdown recovery. It basically summarized the physical power MSU had over La. Tech, and it also summarized Simmons’ day. Mullen said it was supposed to be a conservative punt rush, but Simmons simply leaved over his blocker, swatted it down and also happened to be the quickest to dive on the ball. That combined with his 90-yard fumble recovery for a score will be how I remember this game — and the 3rd and 93. WS: I really hope to see third and 93 t-shirts soon. Aside from that play living in college football lore, how Mississippi State’s defense performed in this game will be discussed. 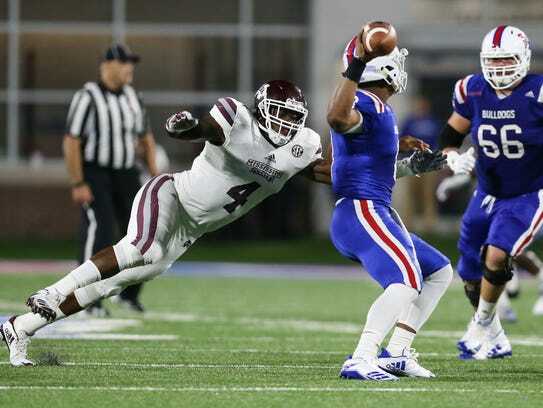 Whether the conversation is “Wow, remember when MSU’s defense looked like it was ready for LSU, but wasn’t” or “Wow, that Mississippi State defense really started to show it was special against Louisiana Tech” is to be determined. BM: To bounce off that, this game either will hardly be remembered because it was a stepping stone to a great season or it will be, like Will said, a weird outlier in a year of struggle. This was the game the front seven made somewhat clear it has explosive playmakers. Whether that will still be the truth come December remains to be seen. 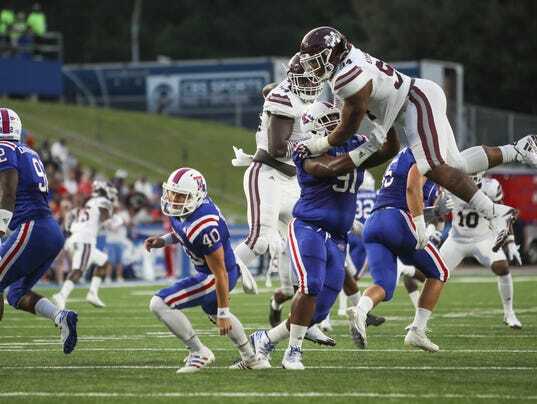 WS: Mullen jokingly said, “Yeah, I think I better keep my mouth shut,” when asked about cornerback Cam Dantzler getting ejected for targeting in the third quarter. Dantzler will have to sit out the first half against LSU as a result. MSU shouldn’t be impacted too much by having Dantzler miss the first half because he part of a position group that is five-deep. It was debatable whether or not Dantzler should have been called for targeting because it appeared like he led with his shoulder and not his head. But nowadays which targeting decision doesn’t create a debate? BM: I won’t pretend to understand this rule more than I do. It boggles my mind. It seemed like he led with his shoulder. Did you see Jeffery Simmons? WS: How could you miss him? Jeffery Simmons had what will go down as one of the best games of his career without recording a sack or even a tackle for a loss. The nose guard instead scored two touchdowns, though, which is a lot cooler for a defensive lineman. Simmons has looked dominant on the line in these first two weeks. A blocked punt, recovered the same blocked punt in the end zone, returned a fumble 90 yards (!) for a touchdown and a blocked PAT is impressive. BM: Todd Grantham spoke last Saturday about using that nose guard to create some havoc and make plays. Simmons took that quite literally this week. He just seems like a game-changing talent, touchdowns aside. He’s been forcing pressure, and is as explosive as some of the linebackers. I really want to see what he can do against LSU. WS: LSU comes to Starkville for a 6 p.m. game on ESPN. It’s as big as it sounds. Mississippi State has the chance to prove its defense is for real against running back Derrius Guice. This is a must-win for the Bulldogs if they have aspirations of being taken seriously in the SEC West this season. BM: As Will wrote last night from the win, this defense just hasn’t shown any identifiable flaws yet. It’s very possible that there are flaws that Charleston Southern and La. Tech have been unable to expose, but that’s the beauty of the LSU game. It’s hard to even make predictions for Saturday, because we haven’t even seen this MSU team struggle yet. What is Mississippi State’s record on Oct. 1? WS: The game against LSU is just the beginning of a tough upcoming stretch of three consecutive games against the best teams in the SEC not named Alabama. The Bulldogs travel to Georgia and Auburn after hosting LSU. 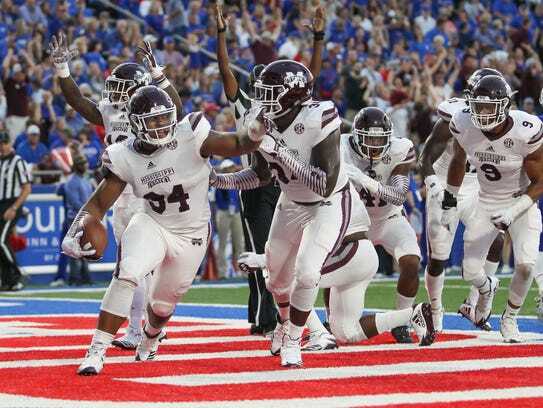 Mississippi State needs to win at least one of these three games and there is reason to think the Bulldogs can. They’ll be 3-2 on Oct. 1. BM: Sorry to be unoriginal, but agreed. Mississippi State will win one of the three. My guess would be at Georgia. It wouldn’t be shocking to see the Bulldogs win two, especially with an impressive showing against LSU. That’s just such a tough slate for three straight weeks. It takes a toll.